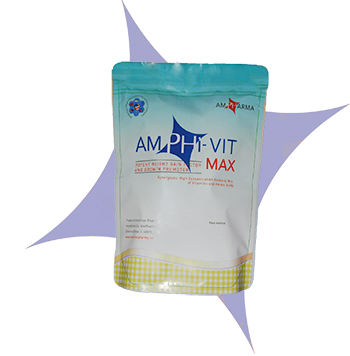 AmphiVit-MAX is a specialty, new generation Amino Acids and Vitamin preparation indicated for all animal species, especially in big-scale animal breeding. Due to a unique combination of vitamins and amino acids with taurine and carnitine, a highly effective product, characterized by strong anabolic action, has been created. This guarantees increase of all production parameters such as: fast and intensive animal growth, acceleration and shortening of fattening period, maximum feed use (and feed usage limitation), and improvement of meat and milk quality. The preparation ensures proper metabolism of fatty acids and amino acids, satisfactory energy production from ketone bodies, regulation of ammonia concentration in blood, stimulation of immunological system, respiratory function, and active transportation of ATP (Adenosine Triphosphate) at cell level. The preparation's composition greatly influences proper functioning of all organisms' systems, especially neuro-hormonal, digestive, cardiovascular and reproductive systems. Carnitine plays decisive role in organisms' efficiency, muscle strength, and activity of cardiac muscle. Combined with amino acids, it facilitates metabolism of the entire organism and neutralizes unfavorable influence of various stress factors. The preparation helps to keep metabolic balance in liver, kidneys and heart, hindering fat atrophy processes in these organs. It also activates digestion through increase in gastric juices and pancreas enzyme production. The correct concentration of the preparation's components facilitates AmphiVit-MAX absorption from the digestive tract. Its concurrent application with chemotherapeutical regimens in feed shortens the animal's treatment time. Administer at the rate of 1 g / 2 liters of drinking water or 1 gm /2 Kg of feed for the first seven days of the animal's life, then in three to four weeks of life for six days. L-Carnitine, Taurine, Biotin (Vitamin H), Vitamin B12, Vitamin B6, Vitamin B1, Vitamin B2, Pantothenic Acid (Vitamin B5), Nicotinic Acid (Vitamin B3), Magnesium Gluconate, Calcium Acetate, Alanine, Arginine, Cystine, Phenylalanine, Glycine, Histidine, Isoleucine, Aspartic acid, Glutamic acid, Leucine, Lysine, Methionine, Proline, Serine, Threonine, Tryptophan, Tyrosine, Valine, Colloidal Silica, water soluble carrier, and other proprietary ingredients and patented mix.